Pink Radio Flyer 3-in-1 Walker Wagon Only $28.47! If you have a little one who’s starting to learn how to walk, I have the perfect thing for you! Right now, you can get this Pink Radio Flyer 3-in-1 Walker Wagon for just $28.47 (reg. $49.99)! And, shipping is FREE with Amazon Prime or with Super Saver Shipping when you spend $35 or more! The 3-in-1 Walker Wagon is not only great for those learning how to walk, but it can be used as they get a little older as well! This converts from a push walker to a ride-on toy to a wagon that your child can pull! We had a push toy that converted to a ride-on toy for my daughter, and she loved it! I sure wish we had gotten this instead because she loves wagons. We would have gotten a lot of use out of it! Find out how you can try Amazon Prime for FREE! Does your son need some new shirts? Then, you’ll want to check out this deal I have for you today! Grab Tommy Hilfiger Boys Ivy Polo Shirts for as low as $13.89! And, shipping is FREE with Amazon Prime or with Super Saver Shipping when you spend $35 or more! These are great for wearing to school (especially if your child’s school has a uniform) or to church! These polo shirts come in sizes small-XL and in the following colors: Capri Blue, Classic White, Masters Navy, Regal Red, Rhinestone Green, Tommy Black and Velvet Blue. Tommy Hilfiger’s solid polo features an embroidered logo for classic appeal. Hungry Hungry Hippos Game Just $12.88! I have a deal for you today on one of my family’s FAVORITE games! 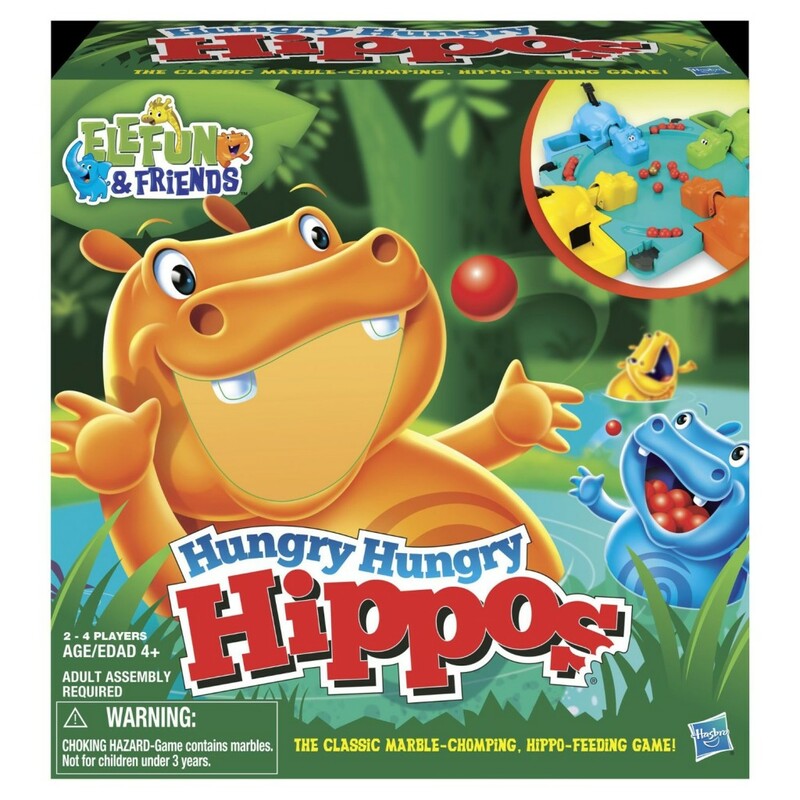 Right now, you can get Hungry Hungry Hippos for just $12.88, down from $21.99! Shipping is FREE with Amazon Prime or with Super Saver Shipping when you spend $35 or more! My daughter is 4, and she LOVES Hungry Hungry Hippos! We play it ALL the time! And, if I’m being honest, my husband and I love it, too. We *might* compete to see who’s hippo can get the most marbles! Mossimo Tank Tops Only $3.15 at Target after Coupon Stack! It’s time to stock up on Spring and Summer clothes, and I have a great deal to get you going! This week, Mossimo tank tops are on sale for $5 at Target and, after Target coupon and Target Cartwheel Offer, you’ll get each one for just $3.15! You can use a Target Cartwheel Offer as many times as you want until it expires, so this is a great time to stock up! I am SO excited that it’s finally starting to get warm here in the South, so it’s time to start get the warm weather clothes out! I can definitely use a few new tank tops, so I’m totally grabbing this deal! Mars Bites Bags Just $1.50 at Walgreens after Coupon Stack! Any chocoholics here?? Then, you’ll love the deal I have for you this morning! Print this $3/2 Mars Bites, 6+ oz. (Snickers, Milky Way & 3 Musketeers) coupon and take it over to Walgreens where you can stack it with the $1/2 Mars Snickers Bites, 8 oz or Milky Way Bites, 7 oz Walgreens coupon from the Walgreens March Coupon Book to pick up Mars Bites Bags for just $1.50 WYB 2! I love these bags because the bites are small enough to get a chocolate fix without feeling too guilty! Final Price = $3 or $1.50 each! Find more Walgreens Deals at Frugal Coupon Living! Know an Xbox gamer who plays Xbox live? Grab a Microsoft Xbox Live Gold Card (12-month) for just $48.99! Shipping is FREE with Amazon Prime or Super Saver Shipping! With this card, you’ll get music, TV, movies and unlimited online multi-player games! I’m betting this price won’t last long – discounts on these cards usually go fast, so make sure you hurry if you want this! Find more Amazon Deals at Frugal Coupon Living! Find out how you can get a FREE trial of Amazon Prime! I’ve got another great deal for you today for those Easter baskets – grab the Webkinz Carrots Mazin Hamster for just $5.99 (reg. $10.99)! Shipping is FREE with Amazon Prime or with Super Saver Shipping when you spend $35 or more! Webkinz are neat toys – they have codes that kids can use in the Webkinz World to care for their virtual pet, answer trivia questions, earn KINZCASH to customize their pets’ rooms and play games. Each Webkinz toy also comes with a unique special item and special food. My daughter hasn’t gotten into these toys yet, but I have a feeling that will be happening soon! This is a great price to start her collection! Oh, you guys, check out these super cute baskets! Right now, you can get these Personalized Easter Baskets – Mini Market Totes for just $21.99, down from $36! Shipping is $4.99. These would be great to grab to use a personalized Easter basket with the holiday coming up! I love anything that is personalized, so this is right up my alley. You can get either your child’s name monogram on them. I’m loving the chevron pattern and totally want to get one for my daughter (she’s into anything pink, so I know she’ll go for the chevron pattern as well!)! And, these can grow with your child and be used for other things besides Easter baskets, such as toting toys and acting as a little picnic basket! The possibilities are endless! My daughter puts her toys in baskets constantly to carry around the house, so we would get a ton of use out of this! Which basket is your favorite?? Find more Online Shopping Deals on Frugal Coupon Living!